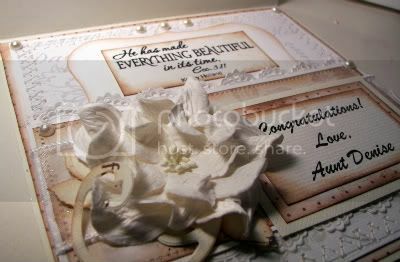 kc242 Designs by Denise: Anniversary Blog Candy: 80th Birthday and Bridal Shower! 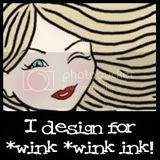 Wink Wink Ink DT cards Welcome Baby! MMSC #55 and the Anniversary Red Carpet Party! Wink Wink INk Stamp Fiona The Fish! Midnight Madness BBQ Party and Sketch #54! Anniversary Blog Candy: 80th Birthday and Bridal Shower! This post will stay close to the top of my blog: For newer posts please scroll down! I had every intention to post my anniversary blog candy on the first, however time just did not allow! I had such a busy weekend. I will be giving away 3 yes 3 blog candy offerings and for every 25 followers over 600 I will add another give a way in honor of my blog anniversary! All that you have to do is follow me, leave a comment and link my blog candy to your blog. If you do not have a blog, just send an email to 5 of your friends about my give a way! On Friday night we attended my father-in-law's 80th birthday cookout. We had lots of fun visiting with family! Saturday, had me heading to northern Indiana, for my niece's Bridal shower. I am so proud of her that she waited until she found the best that God had for her. She was thinking that she was going to be an "old maid"(She is 28). But instead of settling and compromising her values she is marrying the perfect fella for her! I made a bridal card for her last week. I have to say that Charlotte from Midnight Madness gave me the idea for this wonderful card. I wanted to use musical paper, in my card but had difficulty finding anything without alot of color in it. I ended up printing a song sheet out on card stock. Flowers were purchased at Archivers. I used my new Holtz sizzex die cut for the swirls that were cut out of the same musical paper. My eyelet trim are actually paper ribbon, that I just had to fasten down. Scripture sentiment is from Our Daily Bread Stamps. I thought that it was a perfect reminder for her that waiting on God's best is a beautiful thing! 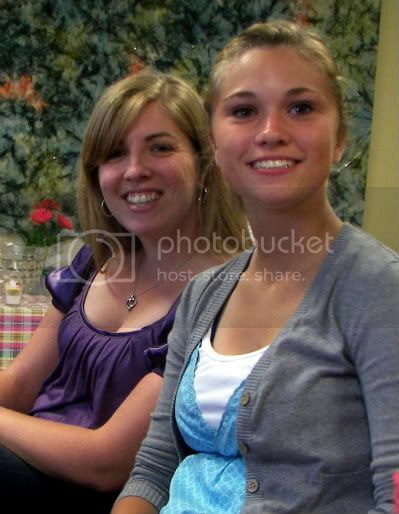 This is a picture of one of the games that we played at the Bridal Shower. 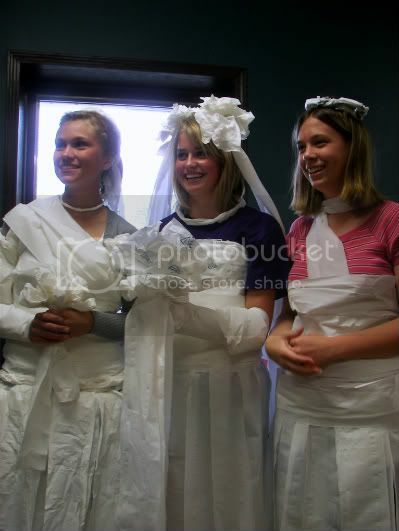 We were divided into 3 groups and given 3 rolls of toilet tissue and had to create a wedding dress. The two girls on the left side are my nieces, Molli and Britney along with one of their friends. They were all good sports. It took forever to braid that toilet tissue without it breaking. Can you tell which group I was in? (hint... far left ;) ) It was lots of fun! Jessica (The up coming Bride, in the background) and her sister Molli. Even though there is a wide age span (11 years) , they are very close! Awesome dress Denise and really beautiful card!!! Thanks for the chance to win your great candy!!! Thanks for the chance for the candy. I put your link in my sidebar. I hope to win, it's very nice candy!!! The card if gorgeous! I loved it immensely! beateful!thanks for the chance to win! link in my sidebar! Happy Anniversary. 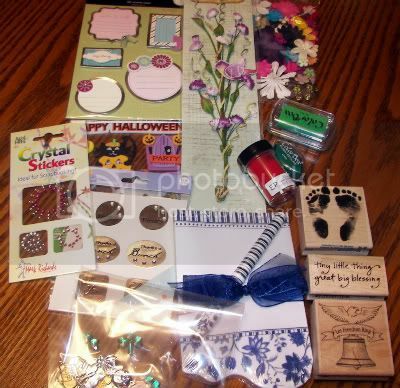 You are very kind to give so much candy, love the butterfly stamp. Thanks for the chance to win your candy!! Thanks for a chance to win such great candy. Thanks for the chance to win the GREAT candy! (when does it end). I love the card that you made! It's adorable. Great card and photos! And awesome candy, thanks for the chance! I linked you up. Wow! Great candy, and what appears to have been a great time! Thanks for sharing. Beautiful card Denise! I'm sure she loved it. Thanks for the chance at your yummy candy, I have posted in my sidebar. Thanks alot for sharing this wonderful Candy! loved the idea of using toilet paper to create pretty bridal dresses. The pics look great! Your Candy is on my sidebar now!! I love your wedding card! I have linked to your candy in my sidebar but I could not use your photograph (sorry) ... your photographs of the paper wedding dresses reminded me of my own bridal shower MANY years ago! 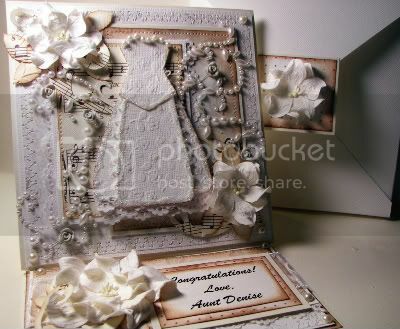 The card is awesome, the bridal dresses of toilet paper are totally cool! bet that was fun :) Happy Birthday to your FIL. and Happy Anniversary! The blog candy is way beyond generous, thanks for the opportunity---great stuff there! 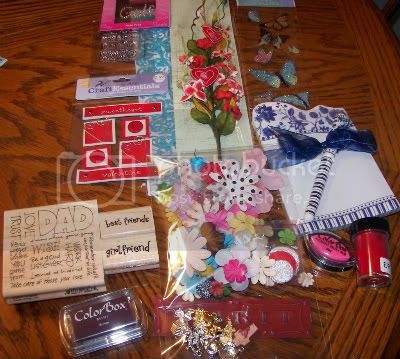 (I'm keen on pile #2) I have been a follower a long time, and I will link your candy to my blog. do I need to post these separately? Happy Anniversary! Stunning Card! 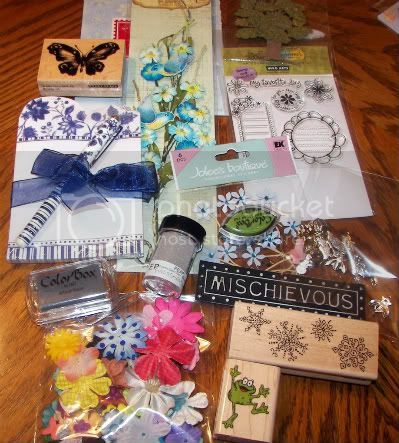 I don't have a blog but have e mailed 5 of my craft pals about your blog candy giveway! 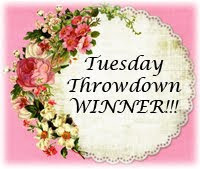 Thanks for giving us the opportunity to win such beautiful blog candy! Gorgeous card! Love the beading and the flowers. Those gals over at MM are a great source of inspiration! Congrats to your niece. I am already a follower and I have linked you to my blog. Happy Everything! :-) As always, you are so generous to offer such great candy (and not once, not twice, but three times over!) I've been following for awhile now, and I'm happy to add your latest goodies to my sidebar at Create With Joy! I am hosting a month-long giveaway - I hope you'll stop by and join the fun! Hi, you have a wonderful blog. And what a amazing blog candy! Would be nice to win. 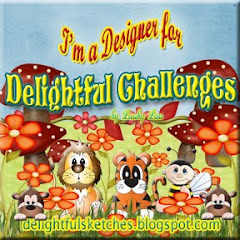 I've linked this blog candy to my blog at the sidebar. Hi Denise!! Happy blogaversary =) Thanks for celebrating with some fantastic giveaways. I always enjoy looking at your creations. Today's card is so elegant looking, great work =) Keep it up! Off to put a pic in my side bar. Thanks! Thanks for this great blog candy! I've become a follower and added a link in my blog. I love your card... so so romantic! You're really great! Thanks for the chance to win this beatiful candy! I'm follower and a link in my sidebar! Happy anniversary and congrat's on your niece's upcoming wedding. I am a follower and here is where I linked you up on my blog: http://myscrappystory.blogspot.com/2010/05/blog-candy-updates.html . Thanks for the chance at the wonderful candy. The card is gorgeous! 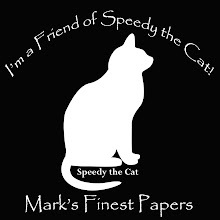 I loved it immensely! Oh Denise, your bridal card is awesome! Thank you so much for sharing this wonderful candy with three lucky winners, that's really generous! I'll post it in my sidebar! You have three wonderful nieces, Jessica is going to be a fantastic bride !! Love the candies! I am now a follower and have linked your candy in my sidebar. Happy anniversary,The bridal card looks absolutely stunning.I am already a follower ,have added link to my side bar for all to see. Thankyou so much for giving us the chance to win. Beautiful card and beautiful foto's. I wish you happy days! I follow you and linked you on my sidebar. Feel free to enter my candy. Beautiful cards and beautiful foto's. I wish you happy days! I follow you ans linked you on my sidebar. Feel free to enter my candy. Awesome Anniversary blog candy you have there Denise. Hope your Anniversary turns out to being the best ever. I have been a follower of your blog for a long time now and I have just added a link to my sidebar. Thank you so much for the chance. Great candy! I’m a follower and I’ve posted it on my blog. Wow, Denise, this card is the bomb!!! Holy smokes girl that one is surely a treasured keepsake. I love it...just stunning. Looks like you all had lots of fun at the Bridal Shower. Congratulations to all!!! thanks for another chance to win great stuff!! Hola las felicito por su aniversario!!! Muchas gracias por permitirnos participar de este candy!!! Posteare su link en mi blog. Thanks for the chance of winning, thats some yummy candy!!! Have linked you to my sidebar!!! thank you for the chance to win the suprise candy!! Your card is a dream! I loved it immensely! Thanks a lot for the chance to win the candy! I've put your link on my left sidebar. Just hope to win! Great card! Thanks for the chance to win!!! Looks like you had a lot of fun on bridal shower. Thanks for the opportunity to participate to this wonderful candy! I love the card that youy made...very beautiful!! You guys looked like you had lots of fun dressing up, in what I believed looked like toilet paper!!! LOL!!! I love the card that you created. It is very beautiful. You guys looked like you were having lots of fun dressing up in what looks like toilet paper!! LOL!! Thank you for allowing us to share this with you. congrats on your blogiversary!!! i must say i was just taken down a trip down memory lane peeking at your "candy"...the feet stamp i used on the girlies' birth announcents (stamped twice) "our house has grown by 4 feet" and the jumping frog- was the first stamp i ever bought! how fun!!! Hi Denise! Amazing candy! Thanks for the chance to win! I love your cards and i am follower now! waht an amazing card, love the attention to datail on it. Thank you for offering this amazing Blog Candy! I posted your Candy on my side bar and already follow your blog. Happy Anniversary!!! The blog candy is fabulous.